Oil & Butter: Celebrating the release of ‘Soap Crafting’, the new book from The Soap Queen! Celebrating the release of ‘Soap Crafting’, the new book from The Soap Queen! Update August 26: The giveaway is now closed and the winners have been drawn, please see the bottom of the post for more detail! 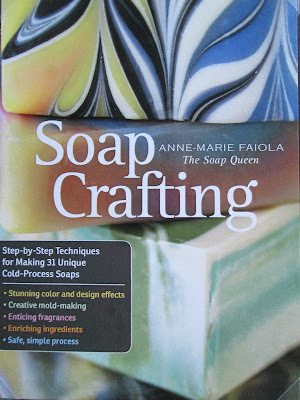 Welcome to one of the stops on the Soap Crafting Blog Tour, to celebrate the release of the new book from The Soap Queen herself, Anne-Marie Faiola! I am very bad at keeping secrets, so you know it took all my self-restraint (plus some!) not to share this news with you guys over the last several weeks. I was very honored and excited when a member of the Soap Crafting publishing team (hi Alee!) extended an invitation for us (you and me!) 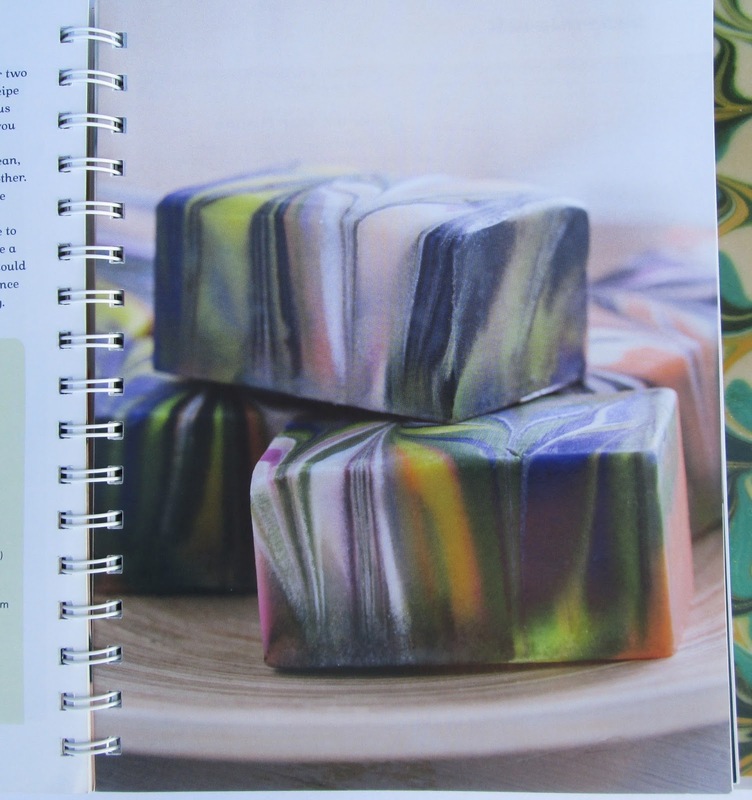 to explore Anne-Marie’s new soapmaking book, Soap Crafting. 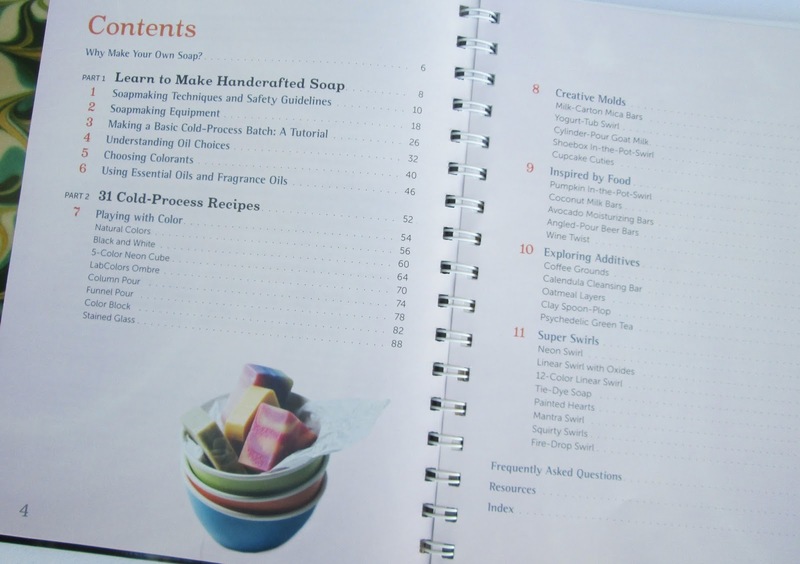 I have to say, it took me all of 2.3 nanoseconds to ponder the offer to join the Soap Crafting Blog Tour; naturally I jumped at the chance for a sneak peek at Anne-Marie’s new book and to try one of the recipes from her book. I was given a choice of 3 recipes to try, and I ended up picking one that would be a challenge for me; Natural Colorants. I’m not super familiar with using natural colorants, but I’ve always admired everyone’s naturally-colored soaps and I have a list of natural colorants I would like to try. 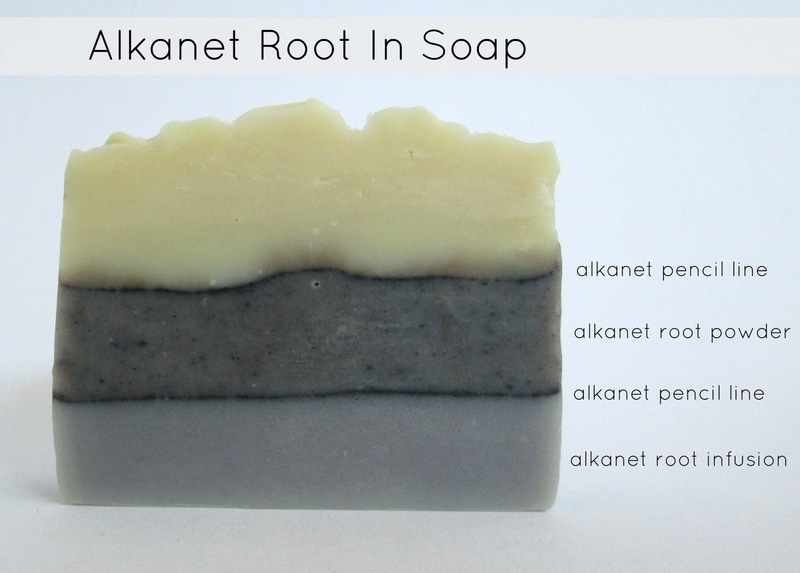 Alkanet Root is at the top of my list, and so I chose to try Anne-Marie’s Alkanet Root & Fennel soap recipe from her new book. I received the book and was immediately smitten. From cover to cover, it is chock-full of valuable information…from basics to advanced, every level of soaper would benefit from having this book in their library. As you can see, this book covers it all - from soapmaking basics such as safety and choosing equipment, to choosing oils, colorants and fragrances…all the way up to simple and advanced techniques such as column pour, funnel pour, painted hearts, different swirling techniques, including the one I’ve bookmarked to try first: The 12-color Linear Swirl, check it out! The Cupcake section of course! Oh, and did you notice that wire binding down the middle of the book? It's brilliant, allowing your book to lay flat so that you can follow the recipes and techniques with ease. There is also a section exploring creative molds (using recycled containers and PVC pipe) and a section on using additives in soap, such as coffee grounds, calendula and green tea. I also thought a really valuable part of the book was the ‘Frequently Asked Questions’ section, which also offers troubleshooting tips and advice for an array of problems soapers frequently stumble across. There is a wonderful variety of recipes included in this book, and the first ones on my list to try include the Avocado Moisturizing bars (using an avocado), Oatmeal Layers (with oat extract and honey) and Cupcake Frosting (which is a whipped soap recipe). Are you surprised that those are all foodie recipes?! Can you tell I’m SO excited about this book?! 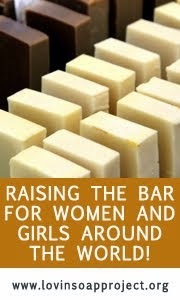 It really is a complete guide to soapmaking, but made even better with all of the techniques, tips and 31 (yes, 31!) included recipes. 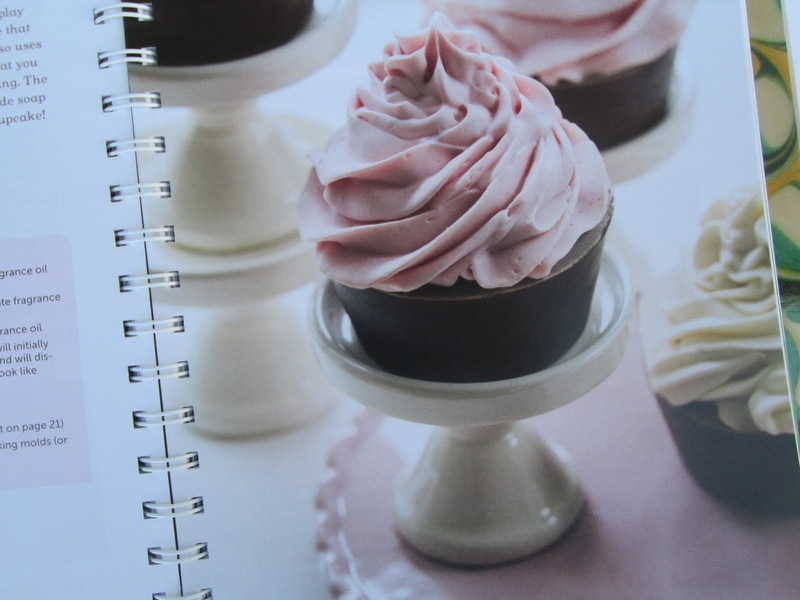 The book is full of wonderful detailed pictures for each technique and recipe. I honestly can't believe how much information they crammed into this book; it's comprehensive but not overwhelming...definitely a must-have resource for any soaper, beginner through to advanced. Now, back to the soap! I really like the way both colored layers turned out, depending on whether you want a solid purple color or speckled purple. 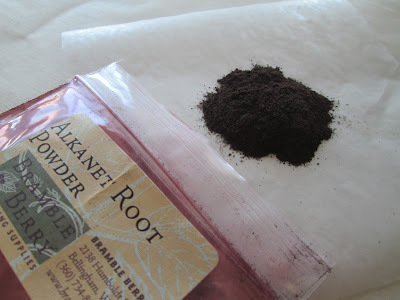 Just a note that the alkanet root powder is slightly scrubby, so if you don’t want exfoliation, you would want to use the infused oil instead. I’m also totally loving this ELF mold they sent along too, it’s the perfect size…super easy to store and take apart, and the optional silicone liner makes unmolding an absolute breeze. I’ve used this many times since I’ve received it and love it! 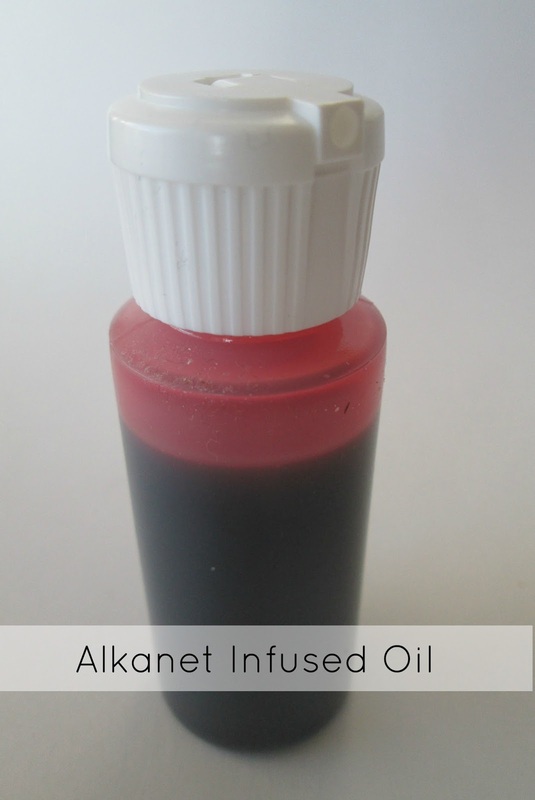 You can see in the video that the alkanet root infusion is actually a wine-red color, but once it’s mixed into the soap it turns purple. Bottom Layer: I added ½ tbsp of alkanet root-infused oil for color. To make the alkanet root infusion: 2 tablespoons alkanet root powder + 4 ounces by weight of sweet almond oil. I infused these by heating the oil and alkanet root together and then strained the colored oil through a coffee filter to strain out the powder. Middle Layer: I stirred ¼ tsp of alkanet root powder directly into the soap at trace. I used some of my leftover fennel essential oil to make a blend with lavender, grapefruit and patchouli, does it ever smell nice! I think fennel is a nice compliment to many other essential oils. Using these natural ingredients has definitely inspired me to play around a bit more with natural colors and different essential oil blends. I’ve since used this soap too, and it is lovely. A silky, abdundant, foamy lather…I will definitely be filing this recipe for use again! Now, I’ve save the BEST part for last! The publishing company has given me an extra copy of Anne-Marie’s Soap Crafting book to give away one of my lucky readers! The giveaway is open to US residents only. To enter, simply leave a comment below telling me what your favorite essential oil blend is, or a natural colorant that you would like to try. For my international friends, I am going to give away a bar of the Alkanet Root & Fennel soap that I made using Anne-Marie’s recipe from her book, you just need to enter the same way…leave a comment telling me what your favourite essential oil blend is, or a natural colorant that you would like to try. There will be other bloggers posting on this blog tour (and more chances for book giveaways!) over the next several days, so keep an eye on Anne-Marie's Twitter to find out who has posted next! Update August 26: Good morning everyone! The names have been drawn for the contest, and the winner of the Soap Crafting book is……Gloria Dawson! Now, Gloria tells me that she already has the book and wanted someone else to have a chance to win it, so she has opted instead for a bar of the Alkanet Root and Fennel Soap. Thank you Gloria, that is very generous of you! So, my daughter drew another name out of the basket, and the official winner of the Soap Crafting book is……Sue! She mentions in her comment that she is a new soaper who wanted to try pumpkin in soap, so I know she will love this book because there happens to be a pumpkin recipe in this book. 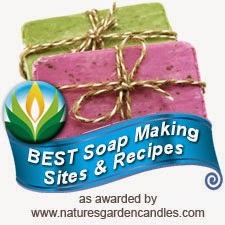 Congratulations Sue, please email me your address and I hope you enjoy your Soap Crafting book! For the international winner of the bar of Alkanet Root & Fennel soap, the name drawn was…..The Soap Mine! Congratulations and I hope you enjoy your soap! 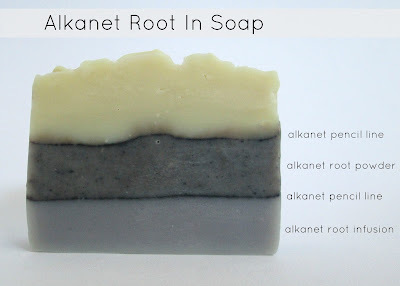 Your alkanet root soap is so beautiful, especially the top. I should practice my piping, but it is so difficult. My favorite blend of essential oils is everything with rosemary. My favorite is now 2 parts lavender, 2 parts rosemary and one part peppermint. Alkanet is something I have wanted to try for long, but it is so difficult to get here in Finland. Another is annatto seed. Your carrot soap was so lovely and even hubby talks about it from time to time. Me too - first I thought I would order that book from Bramble Berry, but delivering costs were too expensive. So I did some Googling and found out that I could get it from Amazon.com for less price and less delivering costs. So I ordered it from Amazon with some other soap making books. Your eo blending sounds interesting, I need to try that too. I have only used one eo at the time. Thanks Marika! Piping is quite easy once you get the hang of it, it just takes a bit of practice. The hardest part is finding a soap recipe that cooperates! I really like rosemary too, and you're right, it is a nice compliment in so many blends. I like rosemary and peppermint, but I never thought to add lavender...sounds wonderful! Signe - that's a great point, international shoppers might want to check out Amazon too. You'll love the book, I can't wait until I have some time to try some of the recipes and techniques in it! Wow, wow, wow, girl, you are so lucky! That book, I will move to US only to have that book! Your soap is very beautiful, love everything about it, Christine! My favourite essential oil blend is made: géranium and clary sage! What a great post Cee! So much great info. I bought this book from Amazon a couple weeks ago and loved it! It has so many wonderful pictures which I love...I'm a very visual learner. Since I have the book I would love a bar of your soap if I win!!! I love anything with lavender...sage, lemon, rosemary, ect! I'm glad you enjoyed the post Gloria...it was the extra-long edition, lol! That's a really great point that I wish I'd mentioned above, the book is very visual with great step-by-step instructions. I'm very much a visual learner too, so I really appreciated that feature. Wow! Lucky lucky you! Bramble Berry is so awesome! It would be really cool to win the book! Been eyeing it! And if luck should be on my side, wouldn't it be such a coincidence that I will be going to the States from sept 3 to 13! I've never tried alkanet root so I'm curious about it. I love lavender, it is such a versatile blender. I love it paired with grapefruit. Smells very fresh and uplifting. P.s. your soap looks great! The top looks good enough to eat and I like the subtle colors of the alkanet root. Thanks Silvia, I agree - BB is awesome, very supportive of their customers! Thanks for your nice compliment on my soap too! I have just discovered grapefruit e.o., and I'm wondering why I didn't try it sooner...I'll have to use it in more blends! Thanks Ksenija, I am very lucky to have had this opportunity, for sure! I see what you mean about maybe not being able to easily obtain some of the ingredients where you are, but just thumbing through the book, I think most things could be substituted easily enough. As for molds, she does show how to make use of recycled containers too, so I was able to get some good inspiration from that. Cee YOU ROCK GIRL!! What an amazing informative brilliant post! ::insert happy dance. I have to admit you and Emily's soap outcome of the "color" of the Alkanet root powder seems very different. She obtained a more yellow color in her soaps. Its neat to think of the variations. I want to try nutmeg and or cinnamon in my raw soap as a colorant. Because its fall and it would be very colorful and fragrant. I need to make a more pumpkin colored soap since my sweet pumpkin looks more like brown sugar pie. Aw, thanks Jen...I'm blushing here! So glad you liked the post, I'm sorry it was so long...I had a lot to say! Emily used annatto seeds for color, which is why her soap was yellow. It's also a wonderful natural colorant to use, I've used it to make orange for a carrot soap and it works beautifully. I am finding that the shades of natural colorants can vary, depending on the oils that you use and the intensity with which you use the colors. It's a science in itself, and I really admire people who are confident with using natural colors! Mmm, nutmeg or cinnamon would be nice in a pumpkin soap. I think paprika gives a nice pumpkin-color too, if I'm not mistaken. Great post! I gradually seem to be using less FO's and more EO's these days - current favourite blend is Peppermint & Rosemary - just lovely. I've used cocoa powder as a natural colourant before, but not much else - definitely something I'm going to try soon though. First stop will probably be annatto seed - I loved the colour that Emily achieved in her soap. Thanks so much for your comment! I would like to make more EO soaps too, I guess I just haven't explored them enough. Peppermint and Rosemary is lovely, you are right...so simple and clean. I think you'll be really happy with the annatto seeds, it's a great natural colorant to start with. Lucky you! :) Beautiful soap...I really like the infusion layer...such a pretty natural color! Turmeric..I would like to try turmeric for a natural colorant. Thanks Kalla, I'm finding that the alkanet root color can really vary depending on the recipe, it's fun to play with! Love you, of course and I don't believe it's the matter of being lucky, it's more the matter of your soap artistry, so you have deserved it, girl! 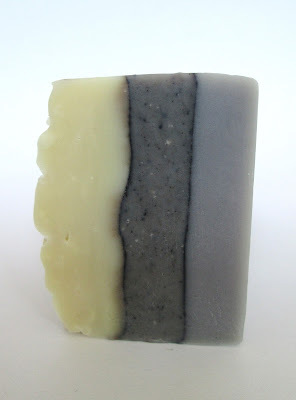 The soap looks cool and I see it as gray, which is strange, but still beautiful! Enjoy reading and, surely watching, your new literature! Aw, I know you really love me! ;) Thanks for your nice comment, you sure know how to make a girl feel good! Alkanet can really switch between gray-blue-purple. It was definitely purple when I first cut it, but as it's cured I think it's faded a bit, I would say it's a very faint purple now. My favourite essential oil combo right now is about 75% lavender and 25% peppermint, but I love almost anything with lavender. And I'd love to find a natural colourant that would produce a mossy green. Everything I've tried eventually goes brown. Lavender/peppermint sounds really nice. I love lavender too, but like you, I prefer it blended with something. Hmmm, mossy green...have you tried spirulina? It gives really nice shades of green, and I believe someone might be doing a blog post with spirulina, so keep an eye out for that! I haven't tried spirulina - I'll have to pick some up when I make my next supplies order. Thanks for the tip. I'll definitely look for that post! I just remembered one natural colourant that I thought I'd mention as it's a little unusual: rhubarb root. I read about Ambra's experience (http://sapuhusid.blogspot.ca/2011/06/rhubarb-soap.html) and it really inspired me to give it a try. I infused olive oil with rhubarb root from my mom's garden and it produced a beautiful light pink colour in a geranium and palmarosa EO soap for my mother-in-law. I infused it for about a month, until the oil was quite yellowish. Apparently the more yellow, the stronger the pink colour. I'd really recommend it. It's a gorgeous soft pink, not like anything I've tried with clays or micas. That is so interesting, a great example of using color morphing to your advantage! Thanks so much Deirdre, I'd definitely love to try this. Yes, woad gives a beautiful blue color I believe? That would be a wonderful one to try! Beautiful soap. My favorite essential oil blend is ginger grass and patchouli with a hint of peppermint. My favorite natural color is madder root I love the red color it produces. Is ginger grass different than ginger? I don't think I've heard of that, I'll have to check it out. Oh yes, I'd love to try madder root, I've seen some beautiful soaps made with it! Great post! Thanks for sharing how your colors turned out. I've been intrigued by natural colorants lately but haven't tried them yet. My fave EO blend is eucalyptus, peppermint, and spearmint. Mmm, your EO blend sounds very invigorating...would be great in a shampoo bar too. Thanks for sharing Angie! I love all citris EO's!! I have never used natural colorants, but very excited to experiment with them soon! Yes, I love citruses too! They always seem to fade in my CP soap though...any tips? Hi there! Yes, I agree, you would have to take advantage of the speckled nature of some of the natural colorants. Lol at your comment about the speckles from micas and oxides, I feel the same way about TD too! As a newbie to soaping I have been having a blast experimenting with recipes and ingredients.So many talented and gifted people in this artistic arena.It so very inspiring. my favorite EO is Holy Basil and I am going to blend it with Black Cumin oil & Patchouli for my next soaping adventure.I will also be using Alkanet for the first time.Thank You for being so inspiring.I love your blog and refer to it OFTEN! Wow, your EO blend sounds mouthwatering! Seriously! I've never smelled Holy Basil or Black Cumin but now I want some...lol! Your comment reminded me that I'd love to try black pepper e.o. too, just have to find some first! Good luck with your alkanet soap, and thank you so much for your nice compliment on my blog, I'm so happy you find inspiration here! Gorgeous soap - gotta get my alkanet out and and start using it! My favorite blend is Geranium, Orange and Sandalwood. Hi Deb, thank you! I really like the sound of your blend, I wouldn't have thought to put those three together but it sounds wonderful! I loved reading your blog post today and seeing your soap, wow it looks wonderful and the top is cool! I've used several natural colorants and really like Annatto Seeds, essential oils blends - Lemon Grass & Tea Tree =) thanks for a change to win Anne Marie's new book! Ooo I would love to win this book! My favorite EO blend is sweet basil, patchouli, rosemary, spearmint and litsea cubea. I call is Green Garden :) It smells SOOOO good! Ohhh, Green Garden indeed! What a lovely blend of EOs, thanks for sharing Catalina :) And good luck! I just wanted to say that your soaps are so beautiful!! I love using a blend of litsea cubea, lemon, lime and orange essential oils. I call it Citrus Tango. I use annatto seeds infused olive oil which helps deepen the yellow I use. Your EO blend sounds so nice, invigorating and fresh. Thanks for sharing and good luck! Thanks for showing us how you did it. 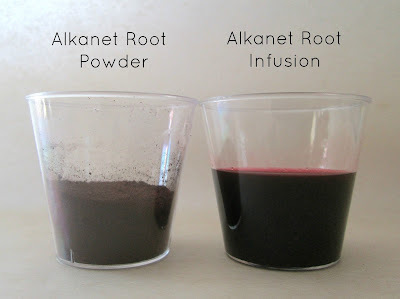 I have never tried alkanet root. I love lavender and ylang ylang blended. Hi Loretta, thanks for posting! I actually love the smell of ylang ylang too but I've never used it, I really should...thanks for sharing! Hello everyone! I recently added a light blend of lavender(French), clary sage, and chamomile(Roman) to my body butter recipe and love it. Hi Shannon, welcome! Chamomile is a beauty EO, probably one of my favorites, but it is so pricey here that I haven't been able to use it. Your blend sounds divine and would be so nice in a leave-on product like your body butter! Cee, tu entrada de hoy es fantástica y tu forma de escribir dice que estas emocionada. Esta es una buena forma de poder tener un jabón hecho por ti, y por eso me apunto a este sorteo. Gracias Paulina por compartir sus fragancias favoritas y por sus amables comentarios! Buena suerte en el concurso! Cee, your soaps looks incredibla and as for the Alkanet Root & Fennel, just love the simple look of it, although I know how much work you had. Love the article about making your own molds. I definitely will try this out! And will buy Anne Marie's book. Thanks for showing us the possibilities of this book! Thanks so much for your nice comments, hope you have a great weekend! Need to leave another comment...:) I've used cinnamon, cocoa powder, coffee, cayenne pepper, ginger powder, curry and pink clay for colouring my soaps and been happy with most of the results. I've also used coffee powder, mango, banana, lavender flowers, rose petals, rosemary, chamomille, birch leafs and nettle as additives and most of times they also add some colour to the soap. I have the same problem than Kirppu/Marika - here in Finland it's difficult to find annatto seeds or alkanet root for example. And those natural purple and pink colours are just what I'd like to get somehow, and green too. 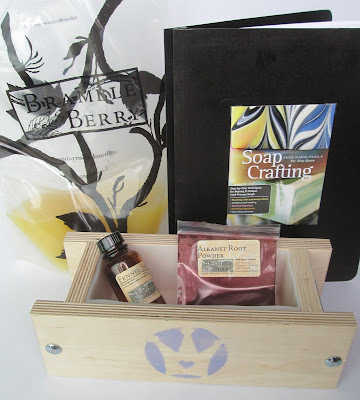 I envy you, Cee - that mold and the whole package from Bramble Berry is so wonderful! 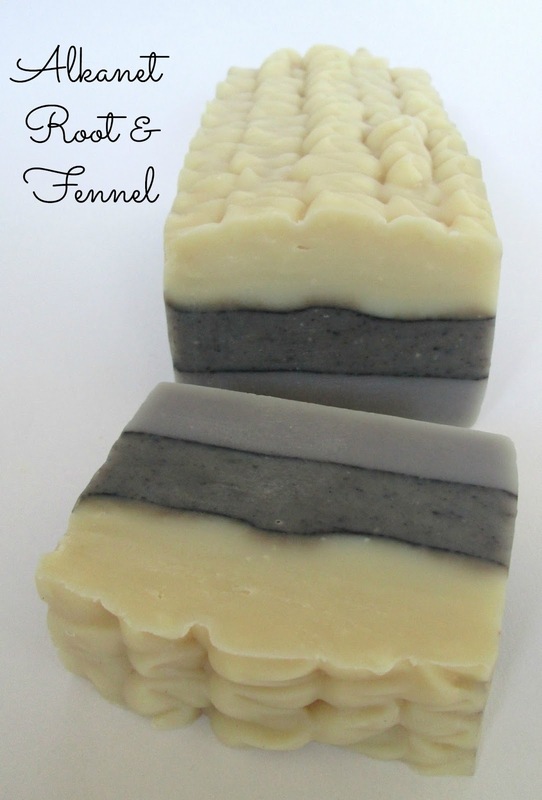 :) And your fennel soap looks like a beautiful dream, it's simple but lovely. Thanks so much about your kind comments about my soap too, I really appreciate it! I dying to get my hands on that book! I am a new soaper, but one natural colorant I want to try is pumpkin. I am obsessed with pumpkin food, smell, and color wise. Thanks for a wonderful post with pictures. I think your soap came out lovely. The dark colors have a lovely natural graphite look to them, and thanks for the chance to win. Hi Sue! As a new soaper, you would really love this book...there is plenty of information on how to get started and how to branch out into trying different ingredients and techniques. I love pumkin, one of my favorites, you'll love it once you get a chance to try it. Thanks for your entry...good luck! What an awesome post! I stumbled across your blog through Facebook and wow! I have been wanting to get this book since it was in it's inception! 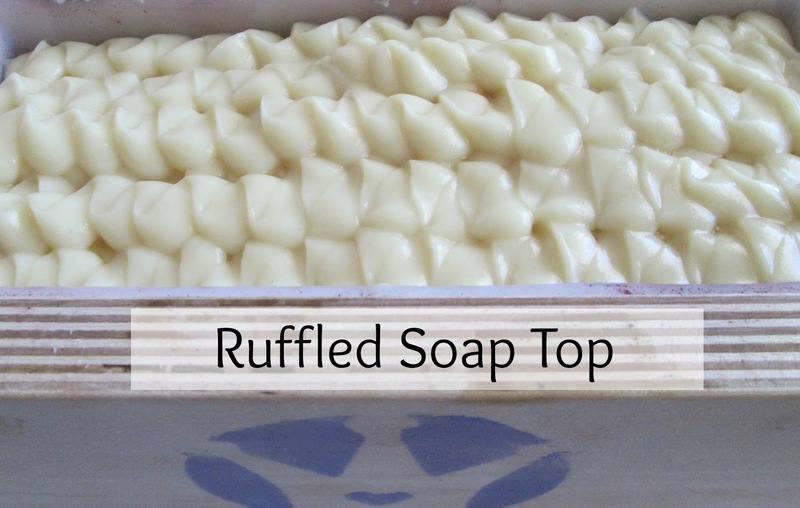 Soap making is one rewarding hobby and business. I'm going to challenge myself this morning with a copper mica pencil line technique because of this post...so excited to try it! My favorite essential oils are lavender, bergamot, patchouli, clove...all of them really lol <3 your blog! Welcome and thanks so much for your nice comments! I'm so excited that your going to try the copper mica pencil line, that is the only other pencil line I have tried and it turned out really nice! Oh, yes bergamot...another of my favorites! I got my start in soaping by watching Soap Queen TV videos. Anne-Marie convinced me I could make good soap and start a business so I can retire in a year or so. 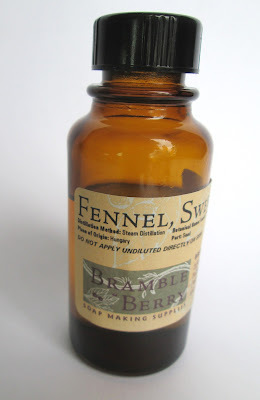 I've bought lots of supplies from Brambleberry and have always been pleasantly surprised. So far lavendar is my favorite scent with Wake Up Rosemary a close second. I've used alkanet root and spirulina to color some of my soaps and can't wait to see what's in her book. Hi Leland, welcome! I really like BB products too, I've never been disappointed either...quality stuff there! Thanks for sharing your favorite scents and colors, is the Wake Up Rosemary a blend? It sounds intriguing! Your soap is just gorgeous!! I love the piped top, very creative and makes a lovely look to your already beautiful soap!! Such a grate post Cee, I really enjoy reading it! You are very lucky to have all those stuff from Bramble Berry.I can only imagine new inspiration and energy which you will get by reading this book. This soap turend out beautiful, I hardly wait to see your new projects! How wonderful that you were chosen to participate in the book release celebration, Cee! Congrats! I don't have Anne-Marie's book yet, but it is on my wish list. Your soap is beautiful, and it's so cool that you used the alkanet as both an infusion and as a powder in the same batch. The fennel EO sounds interesting, too. I cook with fennel seed occasionally, and I love how it smells. I haven't played with natural colorants much, although I do like the color and properties of red Moroccan clay. Activated charcoal is another one that I want to try soon. As far as EO blends go, I loved my recent 70% geranium/30% patchouli combo. I also enjoyed peppermint, lemongrass, and sage together, with the peppermint and lemongrass in equal parts with about half as much sage. Thanks so much Jenny! I haven't tried red Moroccan clay, but I really love using clays in soap..I should try it. My gosh, your blends sound fabulous, I must try them...you guys have given me such inspiration for trying out different EO blends! Hi Barb, I would love to try spirulina too, it's next on my natural colorant list, I just have to get my hands on some! Thanks for sharing your favorite blend too, it sounds lovely! Lol, I wanted to tell you guys sooooooo bad but I had to keep it under wraps...I swear I almost burst! Yay, grats Cee!! I got the book on preorder too, and I love it!! So far I've made batches using the Fire Drop Swirl and Linear Swirl techniques, and can't wait to try the cupcakes! 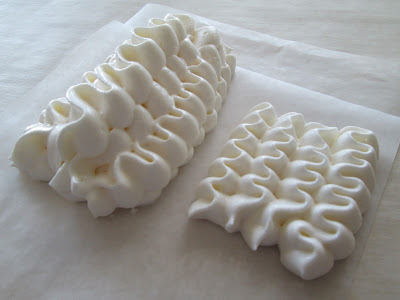 By the way, I used cool whip to practice soap piping recently too, per your suggestion a while back. It worked great! Isn't it a wonderful book, I can't wait to see your swirl techniques! Congratulations! Wonderful review. I haven't experimented much with natural colorants so far and this makes me want to try right away. The photos and descriptions illustrate the process so well. The alkanet soap is beautiful. Thanks so much Lesley, I'm so glad you enjoyed the post! don't know why it didn't print my name?? Hi Debbie, thanks for your comment! Indigo would be really nice to try, but I haven't seen in yet either. Hope you get to try it soon! Hey Roxy, nice to see you! 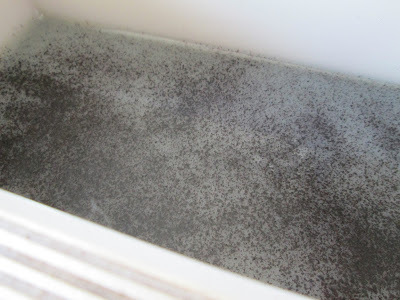 I'm so sorry to hear about your mold, I really hope it is soon...you are a very patient lady! Mmm, fennel and mint would be a wonderful fresh combo. Thanks for your entry and good luck! Hi Angie, welcome and thanks for your comment. 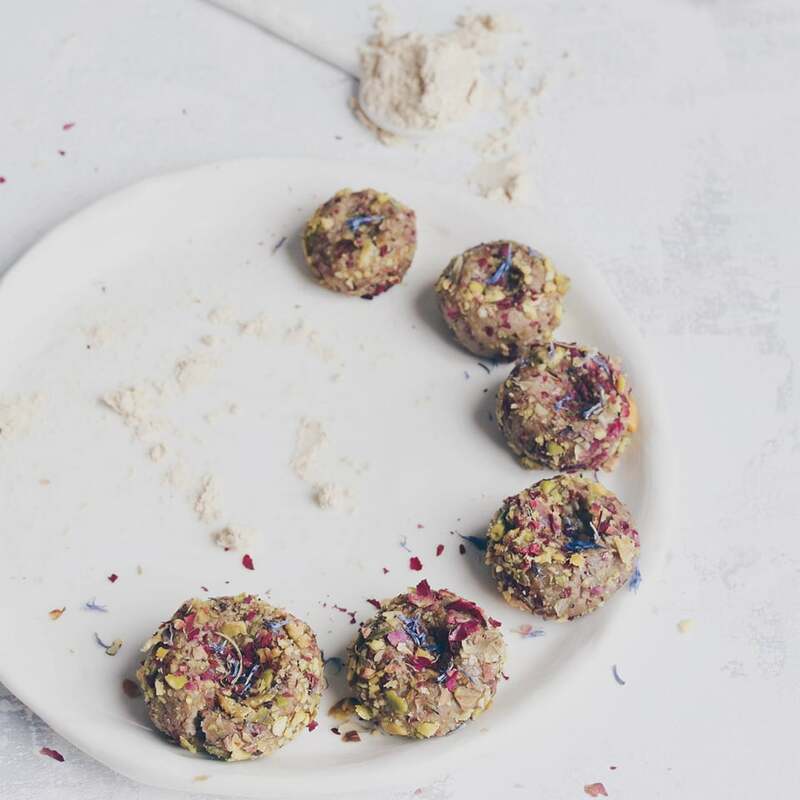 Enjoy trying out your natural colorants, they are definitely worth taking the time to experiment with. Good luck in the drawing! Congrats on being chosen to do the sneak peek and recipe from the book. It just goes to show the lovely folks at BB know how to choose their testers because you've done an amazing job of getting us all excited over it. The first thing I did notice was the binding. 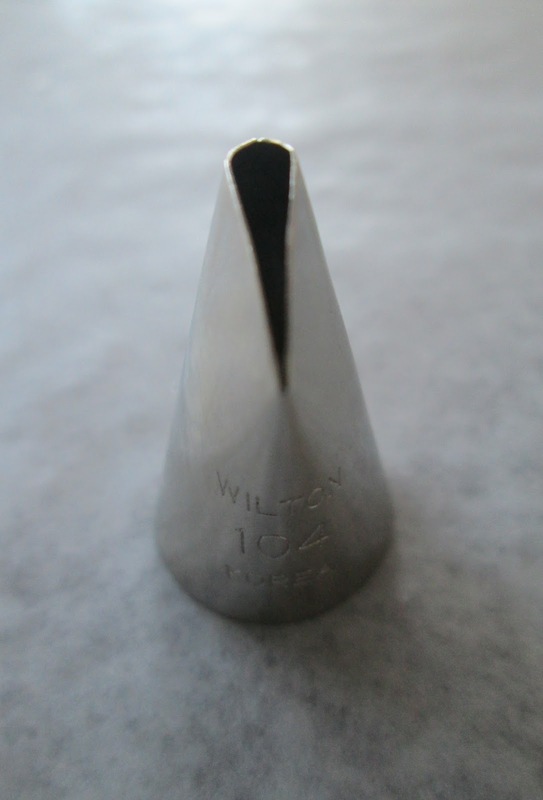 I can't tell you how many cookbooks I've skipped over because they weren't coil bound. It makes it so much easier to work with. Your soap looks so cool! The alkanet root really makes for a beautiful subtle colour. Thanks Monica, that is very sweet of you to say. It was an easy book to get excited about! Yes, from now on I will be paying more attention to the bindings, and that is a very good point when purchasing instructional books such as these. I really love the citrusy EOs too, they blend so nicely too. I've got that book on my Birthday list (Sept. 30th). Hi Gen - orange, anise and clove sound really nice, warm and spicy with a bit of citrua...I would definitely love to give that a try, thanks for sharing! Thank you once again - love your blog! Congratulations to the winners! How sweet of Gloria to pass the book along to someone who doesn't have it. my husband was searching for MI Statutory Will this month and came across a great service that has an online forms database . If people are requiring MI Statutory Will too , here's a https://goo.gl/7a5zLZ. This means that you literally burn fat by eating Coconut Fat (including coconut milk, coconut cream and coconut oil).